For four or more characters from Star Trek: Voyager featuring in a story. Summary: An old proverb says: "When the woodland catches fire, everyone suffers, including the bear". After a 23-year journey across the Delta Quadrant, Voyager returned to an alternate reality in which planet Vulcan had been destroyed. Ten years later, crew still try to cope with discrepancies in their lives. Section 31 leadership mulls over a legitimate concern: Was someone else out there seriously affected by the Narada's temporal rampage? An ancient interstellar civilazation may have not been able to start "lighting-up" Neolithic cultures soon enough and another one may have begun eating their souls too early. Summary: As Voyager draws to the end of its seventh year in the Delta Quadrant, strange things begin to happen. Premiering on January 14th, 2014, in weekly free write #114, the prompt was"family" and is the third entry into that week's free write. Seven of Nine invites Paul Bearrian to the annual Voyager holiday party and both have a time neither will ever forget. Summary: See CAPTAIN PROTON in SEVENTEEN THRILLING CHAPTERS as he battles to SAVE THE WORLD from a diabolical globe-spanning conspiracy! What SINISTER PLOT lies behind the theft of a DEADLY DOOMSDAY DEVICE? What FIENDISH FOE is responsible for the ruthless abduction of BEAUTIFUL WOMEN? What TERRIBLE MENACE threatens the entire future of humanity? Summary: This is a piece I wrote for the monthly fan-fiction contest at Trek BBS where the challenge was to write a piece involving a "what if" scenario. Summary: The crew of Voyager find their Starfleet ideals tested when they rescue a Cardassian member of the Borg. Summary: Parody of the episode "The Killing Game", with references to the BBC comedy series "Allo, Allo", created by David Croft and Jeremy Lloyd. Summary: The first part of a little riff on the whole Voyager scenario, the characters and overall situation is the same but I've had a little fun with it. Hope you enjoy! Summary: The female crew of a commercial space vessel face the ultimate horror when they find themselves being stalked and eaten by a voracious lesbian alien. Summary: She was born Cardassian. Why and how did Seska become a Bajoran Maquis? Summary: Captain Janeway is certain of what appears to be a perfect solution to a serious problem. Chakotay isn't so sure - who is deceiving whom? Kaolla Su has a dream about our favorite lost crew. As the Federation returns to the Delta Quadrant eight years after the the USS Voyager destroyed the Borg unicomplex and a key transwarp hub, the crew of the USS Tesseract -- the fleet's largest and most advanced ship -- has no idea what they'll find there. Just as they launch their seven-year mission, they stumble across a mystery that will soon unfold into an opportunity -- or a nightmare of epic proportions. 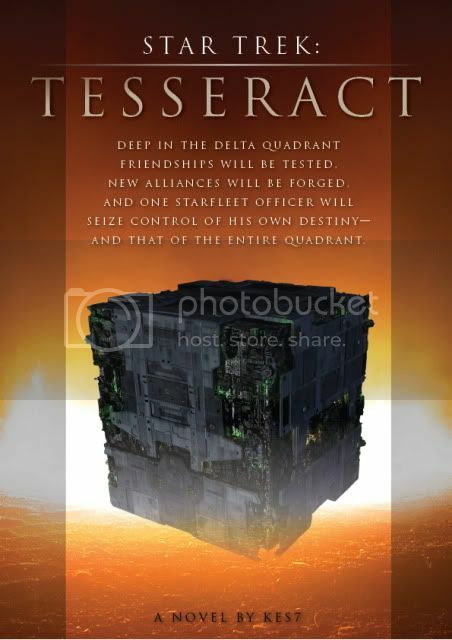 Loyalties are tested, political intrigue abounds, and the Tesseract's ex-Borg first officer will finally seize control of his own destiny ... and perhaps that of the entire quadrant.